Pictured below is an example of new technology that we are using to better serve our customers. The customer was baffled as to why this location had such high water usage when the house is currently vacant. 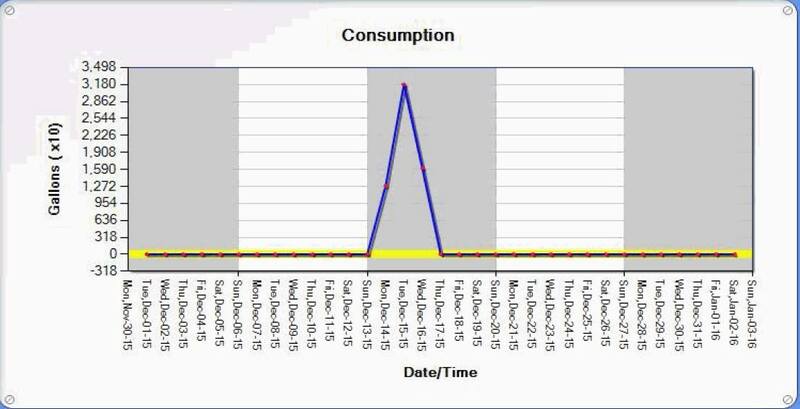 After running our data logging software, it was evident that during a three day period, the water had flowed constantly and then abruptly stopped. Now the customer knows exactly down to the day and hour that the leak took place and can begin to investigate what may have happened at this location. We are currently able to use this technology for all residential customers. Please only request this service if you are experiencing a possible leak or high usage because we must have someone come run each individual meter. Join the conversation and get lots of Crothersville information on the Crothersville Folks Present and Past Facebook page. Like the Crothersville Police Department on Facebook to stay up-to-date with the latest information. Want to know about Crothersville's annual Red, White Blue Festival? Like the festival on Facebook! Make sure to browse to the best little newspaper in town, the Crothersville Times.